Additional Info: 32 inch Flat Screen TV with 60+ Freeview Channels, Ironing Board, Kettle, Vacumn Cleaner, Hairdryer, CD System, DVD Player & selection of Films, Wii Console & Games, Board Games, Tourist Information, Patio Table/Parasol & Chairs, A large lockable Outside Tackle Box. Our top of the range caravan remains one of the best on the park for a bargain price! Our breaks run from Saturday to Saturday for a minimum of 7 nights only, although last minute deals for less than 7 days may be considered on request. A 25% non refundable deposit is now payable within 5 days of a booking being taken, with the balance due 8 weeks prior to your stay. I regret that due to a recent spate of cancellations, bookings for a 2 week period will require a 25% non refundable deposit, with the balance payable 12 weeks prior to your stay. Failure to receive the balance by the due date may result in your booking being cancelled and the week being re-advertised. 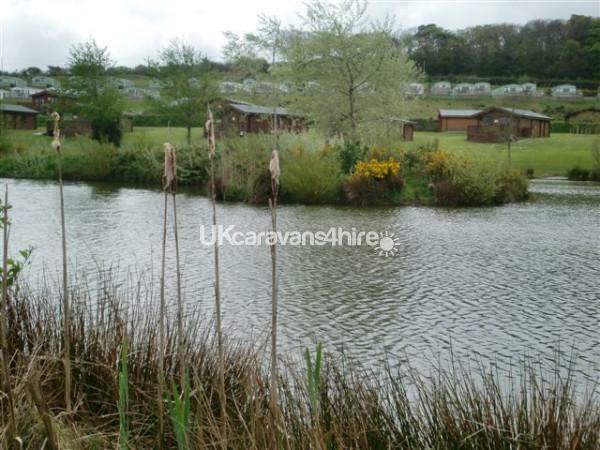 White Acres Holiday Park and it's 13 beautiful Fishing Lakes is set in 184 acres of rolling countryside just 6 miles from Newquay and the Coast and just a 5 minute drive from the A30. The caravan is located in the middle of the park in the quiet new Sycamore Forest development to the side of the main lake - Jenny's Lake. It is within a short walk of all the main Fishing Lakes and the Lakeside Cafe. The main entertainment complex - "The Venue"- has a modern contemporary lounge bar feel, providing a large separate lounge area as well as the stylish Polkerris Restaurant, Bar & Grill as well as the main clubhouse. "The Venue" and the other leisure facilities are just a short stroll up the hill - close enough to be very convenient if required but far enough away if that is not your scene and you prefer a quiet leisurely chill in the sun on our beautiful decking areas. A children's recreational area is close by on the Ash Forest development. This is a beautiful park with lots of lovely nature walks around the lakes. You don't have to be into fishing to appreciate your location and the park acts as an ideal base to explore Cornwall. 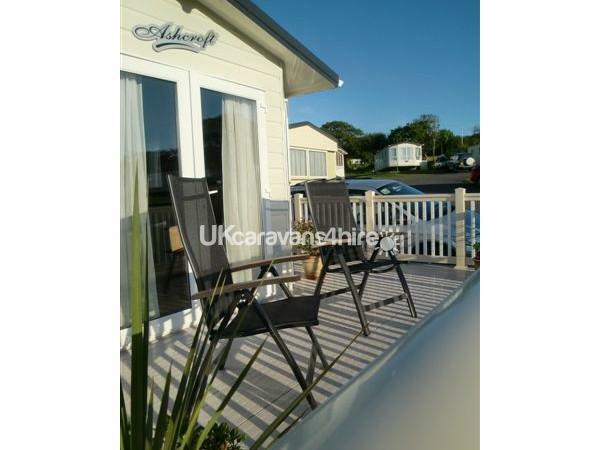 Our 2009 top of the range luxury ABI Ashcroft Caravan is our own private Cornwall "retreat". It is very much a home from home and does not feel like you are staying in a caravan. It is surrounded by two large decking areas to the front and the side so you can soak up the sun whatever time of day it is or eat "al fresco" as the sun goes down. A patio table & chairs & parasol are all available for your use. A lockable outside storage "shed" is available to store Fishing tackle. Please do not bring tackle into the caravan and no bait of any description is to be stored in the fridge/freezer. 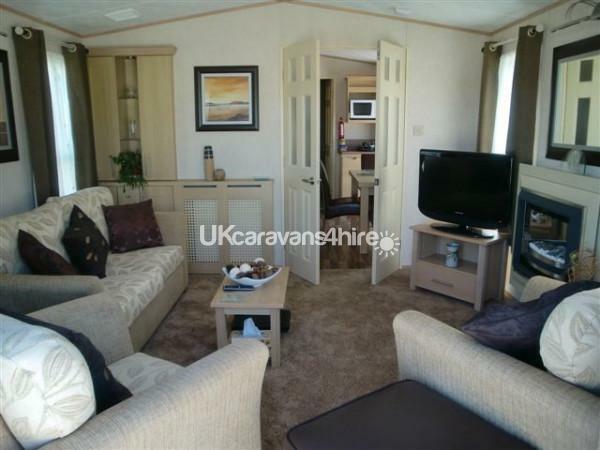 The only caravan we've seen on the market with a proper Lounge in it's own right rather than an open plan Lounge/diner/kitchen.The free standing sofa/sofa bed and two arm chairs create a real luxury home from home feel. Patio doors lead to the Front decking area. A 32" Flat screen TV with 60+ freeview channels, DVD player,iPOD/CD/DAB RADIO sound system and a selection of DVD's are all available for your use. A selection of board games and Tourist Information packs are also available. A Wii Console & assorted games are also now available to use on those unpredictable rainy days! Kitchen with Dining Table and four chairs, Microwave, Fridge, Freezer,Toaster and full range of cooking utensils. Bathroom with full double sized shower unit. Main Bedroom with King Size bed and ample wardrobe/storage space. Door to bathroom providing ensuite facilities. Second Bedroom with two free standing single beds which can be moved together if requested. Ample storage space. The sofa in the lounge converts into a double sofa bed to provide additional sleeping places if required, but this is really only a suitable size for either two children or one adult. Sadly, due to Parkdean removing the Linen/cleaning services previously offered to Private Owners,we now have to request that guests provide their own sheets, duvet covers, towels and pillowcases. The Duvets and pillows are provided. With White Acres being only 6 miles away from the centre of Newquay you are only a short distance from all of the water sports, 11 glorious beaches, fantastic night-life and shops, restaurants galore plus loads of local attractions! Lusty Glaze, a beautiful cove that's naturally sheltered by high cliffs. Newquay Zoo, home to hundreds of wild animals. Eden Project, explore its global gardens and see the rainforest. Blue Reef Aquarium, discover the magic of the underwater world. Dairyland Farm World, meet lots of beautiful animals. Crealy Adventure Park, maximum Fun guaranteed. Welcome to our home and we hope you enjoy your stay. Booking Policy - Terms & Conditions. Our breaks run from Saturday to Saturday for a minimum of 7 nights only. A 25% non refundable deposit is required within 5 days of a booking being taken, with the balance due 8 weeks prior to the holiday date. (12 weeks prior for 2 week bookings) Failure to receive the balance by the due date may result in your booking being cancelled and the week being re-advertised. Should a request for cancellation/termination of booking be made prior to the payment of your full balance at 8 weeks, the deposit sum of 25% will be forfeited. In the event of a request for cancellation/termiination after payment of the balance, then we regret the total hire charge will be payable and no refund possible. Guests should ensure they have adequate holiday insurance to cover such an eventuality. We are sorry but this caravan is a strictly non-smoking and non pet caravan. 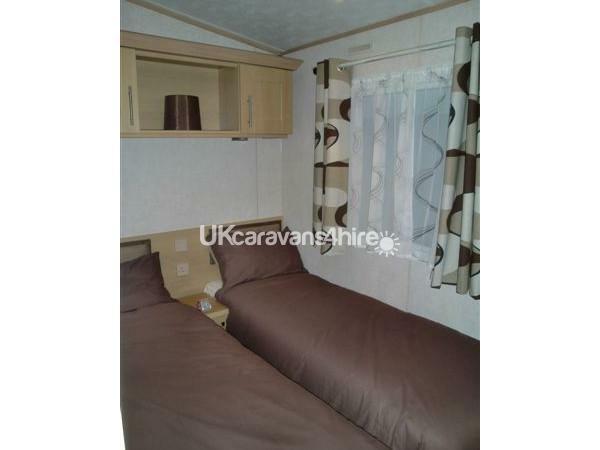 The caravan is strictly 4/6 berth and must not be exceeded. We accept no responsibility for personal injuries or illness, or loss or damages/breakages of personal items including motor vehicles during your stay. Please ensure you are covered with your own insurance. In the event of behaviour likely to cause offence or damage to others or the facilities, White Acres security team and management reserve the right to remove any offender from the park without redress. In such circumstances no refund will be payable. No bookings for parties under the age of 21 are allowed. With effect from January 2010 Parkdean imposed new regulations on fishermen/women who book privately rather than through Parkdean. Guests who now book through private hire arrangements, can no longer pre-book fishing permits which must now be purchased at the fishing lodge at on park prices. Similarly, private hirers are no longer permitted to enter White Acres fishing festivals BUT it is my understanding that you MAY still enter normal weekly competitions. Sorry! Read reviews from people who have stayed at this caravan. These reviews are taken from our Guest Comments Book. Review:	"We have been coming to White Acres for 17 years and this is THE BEST caravan we have stayed in yet! Fantastic caravan with everything we needed. We hope to see you again next year." Review:	"We have had a fabulous holiday at White Acres made even more special by staying in your beautiful holiday home. You obviously care very much about your visitors and this alone would make us want to return. Thank you so very much." Review:	"This is our 4th visit to your wonderful caravan and this time we also had the benefit of staying in your fabulous B&B the night before. Great holiday!" Review:	"We've had a fantastic holiday in your brilliant holiday home and couldn't have wished for better! We will definitely be returning next year...if you'll have us!" Review:	"We have all had a fantastic holiday and this is the best caravan we've ever stayed in! " Review:	"This is now our 3rd visit to your superb caravan but just as enjoyable as the 1st!" Review:	"The caravan was excellent. My grand daughter hadn't been in one for many years and was overwhelmed how lovely and comfortable it was - a real home from home! We will be back again." Review:	"Thank you for making our stay so pleasurable with the welcome gifts and such a lovely caravan - the best we've stayed in by far. Your beautiful holiday home is a credit to you. Thank you so much! Additional Info: Guest Passes can be purchased from Reception. Fishing Passes need to be obtained in person at the Fishing Lodge. Great stay, will book again. All you want .thanks ,pete/Val. Many thanks for taking the time to leave us our first review of 2019 - it's much appreciated. Glad to hear you had an enjoyable stay and we look forward to hopefully welcoming you back at some point in the future. The caravan is the best we have we have stayed in 18 yrs of holidaying at white acres two tackle lock-ups ,location was excellent all fixture and fitting furniture in great condition had an excellent time again returning next June .many thanks for wine nice touch. Many thanks for taking the time to leave us such a prompt and kind review - it's much appreciated. Glad to hear you enjoyed your stay with us and that you felt the caravan lived up to other reviewers excellent comments. We look forward to again welcoming you back in June next year. Many thanks for taking the time to leave us a review - it's much appreciated. We look forward to welcoming you back in the future. 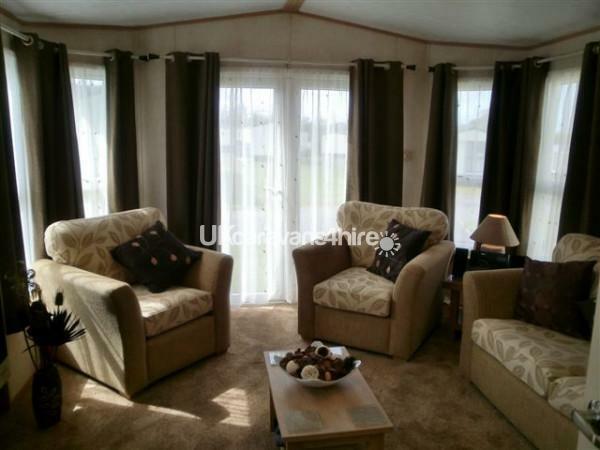 As everyone says this really is a great caravan in a lovely location on the site. The owners Ian & Wayne are great to deal with and have put together a home from home. 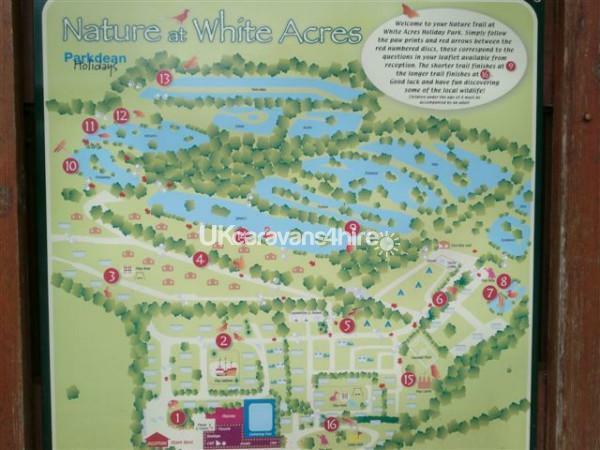 We have used Caravans4hire.com to book all our breaks for the last 6 years and this was our 3rd visit to White Acres, a fantastic park (not too big but has all the amenities) and this is by far the best caravan we have stayed in anywhere ! My only fear is that it will become so popular that we cannot book it again - lol. If that happens Ian & Wayne you will just have to buy another one !! Many thanks for taking the time to leave us a review and your kind comments - it's much appreciated and always good to know that after 8 years new guests enjoy and appreciate our caravan as much as our regular guests. We hope to welcome you back in future years. We have recently returned from a very enjoyable stay in your lovely holiday home, unfortunately the weather wasn't that great but your comfortable cosy caravan made up for it, it was the best we have ever stayed in, there was everything there to make it an enjoyable holiday and we would not hesitate to recommend it to others, we hope to book again in the near future. Many thanks for making the time to leave us a review - it's much appreciated. Sorry the weather wasn't great for your stay but I'm glad to hear the caravan went some way to rectify that. We hope to maybe have you stay with us again at some point in the future. Brilliant caravan great location and the best owners I have dealt with following 17yrs going to whiteacres. Nothing is too small for the owners the DVD player was not working and this was fixed within an hour. 10 out of 10 for every aspect of this caravan and the owners I'm already looking for my next trip. Many thanks for taking the time to leave us a review and your very kind comments. It's always good to know that the personal service and little touches we hopefully are able to offer Guests is appreciated and recognised. We look forward to welcoming you back in the future. Our third stay here. As always clean comfortable and well maintained. We were lucky to have fantastic weather which was the icing on the cake. Book this caravan you will not be disappointed. Best we have stayed in. We are booked for 2018 already. Thanks again Ian and Wayne. Many thanks for taking the time to leave us a review - it's very much appreciated. It's always nice to know that returning guests find the caravan to be every bit as good as when they first stayed with us. Thank you for your ongoing custom and glad you were able to get in quick and secure your 2018 booking! Thank you for letting us stay in your beautiful caravan , it is absolutely immaculate and we had a excellent time we look forward to booking with you again , thanks again . Many thanks for taking the time to leave us a review - it's much appreciated. Glad to hear you had a good holiday with us and we hope to see you again in future years. Thank you for again leaving us a review on your stay - it's always good to know that we have maintained our standards and the caravan remains as good as ever- even after 6 years! We look forward to hosting you again in 2017. Thank you for leaving us such a kind review - it's much appreciated. Glad you enjoyed your stay with us and we look forward to welcoming you back in the future. Many thanks for taking the time to review your stay with us and your kind comments - it's much appreciated. We look forward to welcoming you back again in 2017. We highly recommend this caravan, and the owners. They are professional from enquiring about the caravan, to booking it and the welcome gift and card they leave for you. The caravan is extremely comfortable and very well equipped, it is located in a really nice area of the park, with the lakes nearby, and not too far to walk to the amenities. We can't wait to return in 2017, I wish it was sooner. Had a fab holiday really enjoyed it. Caravan was lovely and clean. We will def be booking again for next year. Many thanks for taking the time to leave us a review - it's much appreciated. I'm glad you had an enjoyable stay with us and we look forward to maybe welcoming you back in the future. This was the second visit of ours to what can only be described as the best caravan in the country. It is so well laid out, with a large comfortable King sized bed in the main bedroom, and a superb kitchen/ dining room that is equipped with every thing you will ever need. The shower is wonderful and easy to control with good water pressure. Large double doors lead from the super lounge area out onto a spacious decking area that runs around the virtually the whole length of the caravan. The lounge itself can be closed off completely from the kitchen, so you feel as if you are in a house. It is equipped with tv, radio, books, games, dvd player, fan, coffee table, footstool, games console and a 3 piece sofa!. Brilliant. Outside there are two good sized padlocked storage lockers that swallowed all my fishing gear with ease. Ian and Wayne communicate promptly to any enquires and booking is simple and information passed to you is comprehensive. There was even a nice bottle of wine waiting for us on arrival. Many thanks Ian and Wayne, you are a credit to the holiday lettings business. See you next year. Many thanks for taking the time to leave us such a detailed, comprehensive and very kind review - it's much appreciated. It's always good to know when we try and go that "extra mile" to make our guest's stay enjoyable, that our efforts are appreciated. I'm glad you had a great week and we look forward to hopefully seeing you again next year. Many thanks for taking the time to leave us a review and your kind comments - it's much appreciated. Glad to hear you had such an enjoyable stay with us and particularly that you found the bed so comfortable - it is a nice mattress! We hope to maybe see you again in future years. The caravan is absolutely beautiful and spotlessly clean. It's in a great position and has everything you could possibly need. The mattress is extremely comfortable, something we have struggled with in previous years. A lovely touch was a welcome bottle of wine with a little note wishing us a happy holiday. I've stayed on this site before in one of the park's caravans but this caravan doesnt even compare. Would highly recommend and definitely book again if we come to Cornwall. Thankyou Ian & Wayne for letting out your fabulous caravan . This was the best caravan we have stayed in by far.it's so comfortable and very well equipped it's a real home from home lots of games,dvds,and even a Wii console that help keep our 3 year old grandson very happy.many thanks to Ian and Wayne for allowing us to share this beautiful caravan you should be very proud of what you supply to your customers top marks guys.well worth the drive from Bury Lancashire. Many thanks for taking the time to leave us a review and your kind comments - it's much appreciated. It's always nice to hear that our Guests appreciate the little extras we provide to make your stay even more enjoyable. We hope to maybe see you all again next year. Many thanks for taking the time to leave us a review - it's much appreciated. Hope the move down here goes well and glad we were able to re-arrange your weeks stay to accommodate your need to be down here earlier than planned. Many thanks for taking the time to review us again - it's always appreciated and it's always good to know that the caravan continues to be presented to the same standard as it was when you first visited and you like other previous guests still wish to stay with us rather than in other vans on the Park. We look forward to welcoming you back in 2017...if not later in the year! Many thanks for taking the time to leave us another review & your kind comments - it's again much appreciated. Glad to hear you had such a good week despite the weather. Hope to see you again next year - enjoy your week in the sun at the end of the month! Totally agree with all the given praise from the reviews below. Just returned and highly recommend. Thank you - we are hoping to book with you again! Many thanks for taking the time to review us and your kind comments - it's much appreciated. We look forward to welcoming you back in the future. Beautiful caravan. Fantastic facilities and brilliant layout.. Really relaxed fell to the site and enjoyed sitting out on the decking. Would definitely recommend this caravan to family and friends. Many thanks for taking the time to review us and you kind comments - it's much appreciated. We hope to maybe see you again in the future. Ian and Wayne's caravan is fabulous! It's beautifully presented, has lots of storage, and has everything you need. We felt very spoilt in comparison to previous holidays we've had. The Wii console, DVDs and games made our rainy days much more fun! The bedrooms are luxurious, particularly the main one and have comfortable beds. 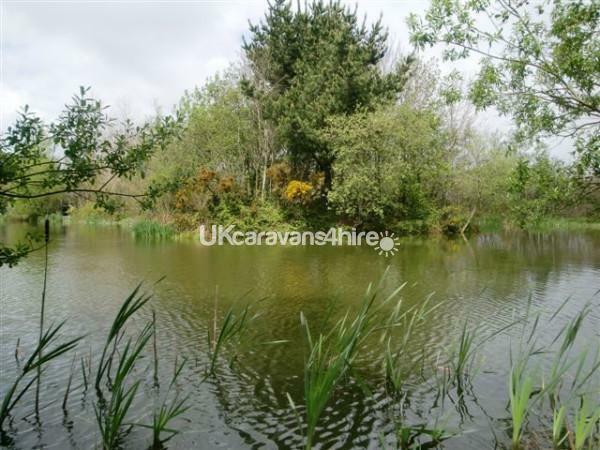 The patio is well kept with nice patio furniture, and the location of the van is perfect for peace and tranquility, not far from the fishing lakes, which makes a lovely woodland walk. The kitchen has everything you need, all utensils and more! On our arrival we were greeted with a bottle of wine for us and sweets for our 3 year old, which is a lovely gesture and again above and beyond what we expected. Great customer service and easy to get hold of, if ever there was a problem. It's a real gem and we will be highly recommending you to our friends and family! Hope to be back soon!! Many thanks for taking the time to leave such a detailed review and your kind comments - it's much appreciated. It's always good to know that new guests who have not stayed with us previously are as enthusiastic and complimentary about our lovely caravan as those guests who have come back year after year. It was a pleasure to have you all stay with us and we look forward to seeing you again in the future. Well what can I say that the other brilliant reviews of Ian and waynes caravan have not already said....except that they are understated. This van is so comfortable and of such good quality that I am amazed they would let strangers rent it. From the excellent quality mattresses and pillows to the shower that actually worked ( unlike most caravans I've been to), the whole caravan was immaculate. My partner said that she had the best sleep she has had for years and she has just bought a new memory foam mattress!. The caravan is fully equipped with everything you need during your stay, from the kitchen utensils to the DVD's and games etc in the lounge. Outside the large decking area with table, chairs and parasol was perfect for relaxing on after a hard days fishing, and the locker for your equipment is of a good size and secure so no worries there either. When communicating with Ian you get the feeling straight away that he wants you to have a fantastic time and the welcoming card and bottle of wine only reinforce that message. I can not recommend this caravan highly enough. See you next year guy's. Many thanks for taking the time to review us and your very kind and detailed feedback - it's very much appreciated. We are so glad you had a great stay with us and that you have chosen to book again with us for 2016 already! It is good to know that as we always try to go that extra mile to make our guests welcome, it is so appreciated by our guests. 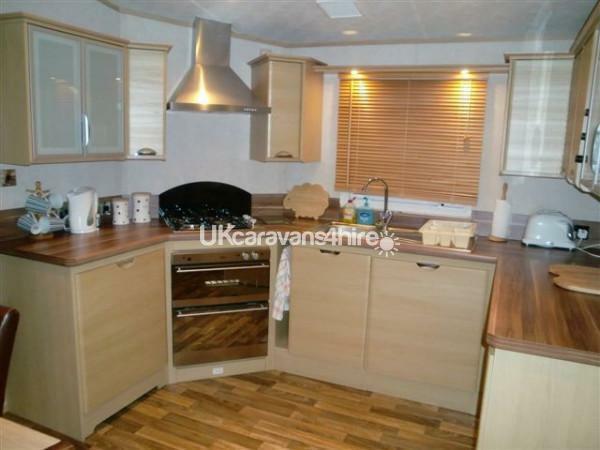 As said in other reviews, this is a lovely caravan with very high standards.Lots of extras in the van which you don't get when booking direct with Parkdean.Communication great with the owner from start of booking to after our holiday. You couldn't ask for more! Many thanks for taking the time to leave us a review and your kind comments - it's much appreciated. We hope to maybe see you again in the future. Many thanks for taking the time to review us and your very kind comments - it's much appreciated. While we welcome back guests year after year, it's always nice to know that new guests find our caravan equally great and having experienced it, also wish to stay with us again in the future. We look forward to being able to accommodate you again in the future. This caravan is like home from home and has everything you need for a great stay. Lovely to sit out on the decking and enjoy as we had lovely weather! The king size bed, hair drier and DVD player make it for us. Booking and paying are made easy. Ian and Wayne get so many good, deserved reviews. Also so many repeat customers (like us) that shows they are getting things 100% right. See you next year! Many thanks for taking the time to review us and your very kind comments again - its much appreciated. It's always nice to know that when we try and go that "extra mile" to make our guests stay an enjoyable one its equally appreciated. It's nice to know that with so many other caravans for hire on this website compared with when we first joined, guests like yourselves still choose to come back year after year - thank you. Just returned from a great week in this caravan. Best we have ever stayed in. Loved the good quality mattresses and pillows. 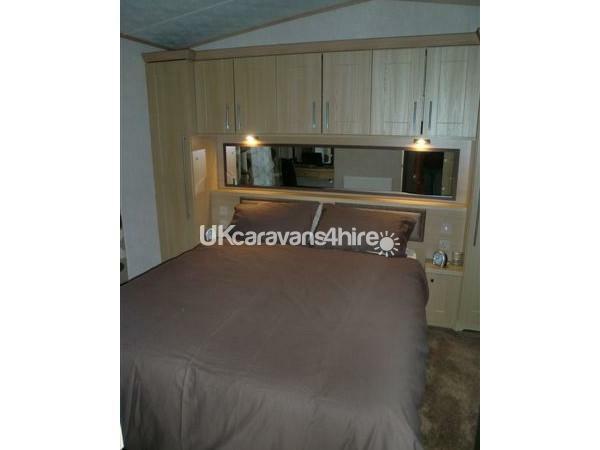 Whole caravan immaculate and luxurious. Fully equipped, a real home from home. Bottle of wine and welcome card a lovely touch. Met Ian the owner, very pleasant and helpful came immediately when we had a minor hiccup with the boiler and sorted it there and then. Will definitely be booking again. 5. Star! Many thanks for taking the time to review us so quickly and your very kind comments -it's very much appreciated. I'm glad you all enjoyed your week with us and thank you for leaving the caravan in such an immaculate state. I hope to welcome you all back at some point in the future. Many thanks for taking the time to review us again for 2015 - it's much appreciated. We look forward to welcoming you back at some point in the future. Many thanks for taking the time again to leave us a new review. It's good to know that even after staying in the caravan for the last few years you still regard it so highly - thank you. Look forward to hearing from you again next year. Another fabulous week in this fantastic caravan It is so comfortable and has everything you need Due to the gorgeous weather we were able to spend time on the lovely decking area. We would not hesitate in recommending this caravan and hope to return in 2016. Many thanks again for taking the time to leave us a new review for 2015 - it's much appreciated. We have always tried to maintain the caravan to the standard as it was when new and the fact that so many guests like yourselves feel it is as good as the first time you stayed, hopefully shows we have succeeded. We look forward to booking you in again for 2016! My boyfriend and I stayed in this caravan as a gift from my parents for my 18th birthday. I have stayed here before with my family and the caravan is still as beautiful as it was when I first stayed in 2010. I would thoroughly recommend this lovely caravan to both old and young alike. It's now like home from home for me. Thank you. Many thanks for taking the time to review us - it's much appreciated. I'm pleased that you both had an enjoyable stay and hope you enjoyed the surprise when Mum & Dad joined you! Look forward to continuing to see you all again in future years. Stayed in many caravans at this site but this caravan was far the best. The caravan was beautiful and clean! Had a brilliant stay and will deffo be staying here in 2015 :) lovely pleasants owners too! Many thanks for taking the time to leave us a review- it's much appreciated. We look forward to hearing from you next year. Many thanks for taking the time to review us - it's much appreciated. Glad you enjoyed the wine and thank you for taking the trouble to recommend us to others. We hope to have you stay as our guests again in the future. This was the 2nd time we had stayed in this caravan and it is the best caravan we have ever stayed in. We have stayed in a lot of caravans over the years on our family holidays and this caravan is like home from home, it is just a class above all the others. It is completely spotless and has exceptional furnishing standards, and a credit to the owners. We had great communication when booking from Ian and Wayne. I would recommend this caravan to anyone, and we will definitely be back again in the future. Many thanks for taking the time to review us and your kind comments - it's much appreciated. It is always nice to know that our guests agree the caravan is of such a high standard and that despite the number of guests who have stayed with us , we have continued to maintain it to that standard. We hope to see you for a third visit next year. We were very impressed with your holiday home, very comfortable everything in that you need and a lovely touch with the dvd's information and wi system if you wanted it. Having stayed this 2nd time on Sycamore and having walked around the park we do prefer this area and will certainly be returning hopefully next year. The whole interior is lovely and your every need catered for from checking availability and booking it was very straight forward and easy. We loved the decking area and the lovely patio doors leading onto it lovely sat in there at night with a lovely breeze blowing through so relaxing. We would recommend your holiday home to others we had a fantastic week the weather was great but even had it rained we would have had plenty to do with the games and DVDs the bottle of wine was such a lovely gesture so thoughtful many thanks again for what for us was a perfect break. Many thanks for taking the time to review us - it's much appreciated. Glad you enjoyed all our "little extras" and had such an enjoyable stay. We look forward to welcoming you again next year. Many thanks for taking the time to leave us a review - it's much appreciated. Glad to hear you again enjoyed your stay and we look forward to welcoming you again next year. Had a great week in this absolutely lovely caravan. A real home from home in a prime location on the site. The caravan was immaculate and very well laid out. Like other reviewers have said, this is the best caravan we have ever stayed in. Thank you for the very welcome bottle of wine and jelly babies on our arrival too! Many thanks for taking the time to review us - it's much appreciated. I'm very pleased to hear that you had such a great week, which was your first staying with us. It's always nice to know that new guests appreciate the caravan and the personal touch we provide as well as long established guests. We look forward to you maybe staying with us again next year. 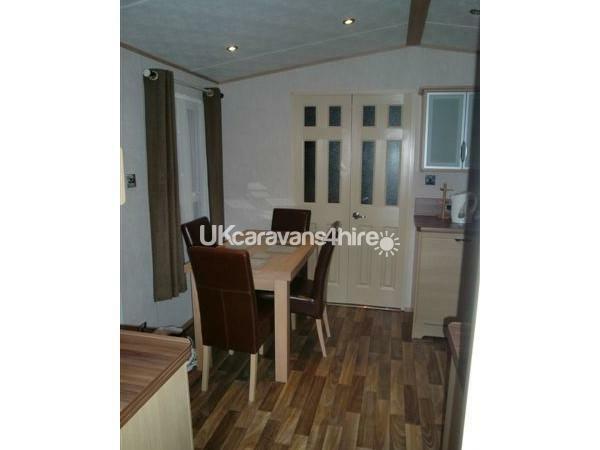 Fantastic caravan, immaculately clean and brilliant layout, really enjoyed sitting on the decking. The wine was much appreciated after a long drive! Had fun playing on the wii and with the board games. I would defiantly recommend this holiday home to my family and friends and hope to return in the future. Many thanks for taking the time to review us - it's much appreciated. Glad you enjoyed the wine and we look forward to you maybe staying with us again in the future. Many thanks for taking the time to review us and your kind comments - it's much appreciated. It's nice to know that as we always try and "go that extra mile" to make our guests stay more enjoyable, our efforts are appreciated. We look forward to seeing you again next year. Had a fantastic week in this caravan. Was greeted by a bottle of wine and a bag of jelly babies which was a very nice touch! The caravan was exceptional in every way, it was spotlessly clean and had everything you could possibly need, a real home from home we will definitely be staying in this caravan again. Decking area was perfect for our 1 year old daughter to play on as it was secure. Many thanks for taking the time to review us - it's much appreciated. Glad you enjoyed the wine and sweets. Hope to see you all again next year. Many thanks for taking the time to review us - it's much appreciated. So pleased to hear you had a good week despite the weather. We look forward to maybe seeing you again next year. It was lovely to hire your caravan for the first time I do not think it will be the last. Ian and Wayne it was a pleasure to meet you both. The welcome pack and Bottle of wine was a great way to start the holiday. Also thank you for the kind comments of how clean we left your Caravan. PS Hope Wayne's next visit to the pools is a better one if he wants some tips tell him to send an email I will try to help him out. HA. HA. HA. GOOD LUCK TO YOU BOTH FOR THE FUTURE. From Jayne and Pete. Many thanks for taking the time to review us - it's much appreciated. It was nice to meet you both. Glad you had such a good week and enjoyed staying in our lovely caravan for the first time. We hope to be able to accommodate you again in the future. This is the 4th year that we have rented this caravan. Each year the caravan is in the same condition, clean and perfectly equipped for a weeks holiday. From booking, payment, receiving instructions and getting there, the owners make it easy and not stressful at all. It is a real home from home in terms of the layout and facilities. You can shut off the lounge, the kitchen and even the bedroom/bathroom areas so everyone has peace wherever they are. 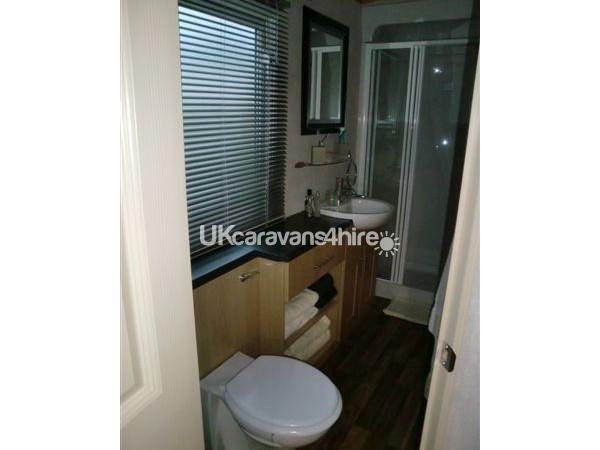 We have used this caravan as a couple and also as 4 adults one year, we each had enough space and was not under each other's feet. Great holiday home, great spot on the park, the decking all the way around is great. You can sit at the back door by the kitchen/dining area or at the front where the patio doors open from the lounge. Car parking for car is right by the caravan too, so fantastic for unloading and loading back up at the end. Sure we will be back next year :-) Thank you for your hospitality when we came and met you too. Many thanks for taking the time to review us and your very kind and detailed comments - it's very much appreciated. It's always nice to know that our guests staying in the caravan appreciate the efforts we put in to make your stay as enjoyable as is possible. We look forward to seeing you both again next year and feel free to pop in the the B&B for a cuppa anytime! we don't need to look any further for a caravan too stay in.this caravan has everything you need.the service couldn't be any better and cant wait to visit again.the caravan is brilliantly situated for the lakes and is immaculate inside.i would highly recommend this caravan to anyone but not on my dates cheers.once again from my family and me see you next year and thank you. Many thanks for taking the time to review us - it's much appreciated. We look forward to seeing you and the family again next year. Thoroughly enjoyed our second visit to Ian and Wayne's caravan. It really is a lovely caravan in a really nice park. New mattresses and duvets really comfortable. Plenty of games. Children were really impressed with the new Wii console. Excellent customer service as usual. Cannot fault. Many thanks for taking the time to review us - it's much appreciated. Glad you enjoyed our "new features" and hope to see you again next year. 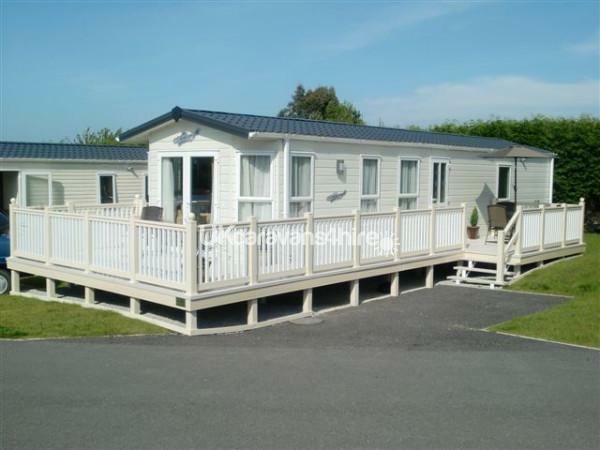 This was our 2nd visit to this Caravan and have been visiting Whiteacres for 20 years. This is by far the best caravan we have ever stayed in. Everything about it is quality,furniture,fittings,bedding etc. and it is just so comfortable. It is located in an ideal position and the outdoor decking area is great. The owner has put a lot of thought into holiday needs and goes over and above what is expected - he genuinely wants you to have a great holiday !. I do not hesitate in recommending this Caravan - you wont be disappointed ! We cant wait to go back again. Many thanks for taking the time to review us - it's much appreciated. It's always nice to know that people appreciate when we go that extra mile to make your stay even more enjoyable. We look forward to seeing you again next year!